Synthetic peptide: LAIKTKNFGFV, corresponding to C terminal amino acids 2789-2799 of Human EDD. GenBank Accession Number – NP_056986. LocusLink ID - 51366 (human); 70790 (mouse); 117060 (rat). 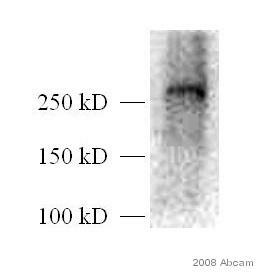 Gene Ontology terms - ubiquitin conjugating enzyme activity; ubiquitin-protein ligase activity; ubiquitin cycle; cell proliferation; protein modification; soluble fraction; nucleus; ligase activity. Our Abpromise guarantee covers the use of ab4376 in the following tested applications. WB 1/500. 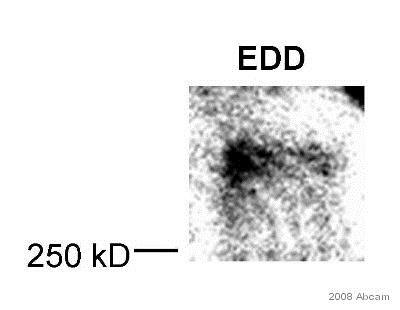 Detects a band of approximately 309 kDa (predicted molecular weight: 309 kDa).Can be blocked with Human EDD peptide (ab23029). IHC-P Use a concentration of 1 - 2 µg/ml. Perform heat mediated antigen retrieval with Tris/EDTA buffer pH 9.0 before commencing with IHC staining protocol. No results could not be obtained after antigen retrieval at pH6. 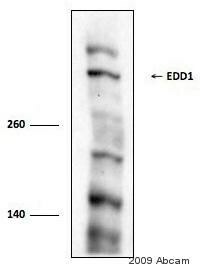 E3 ubiquitin-protein ligase which is a component of the N-end rule pathway. 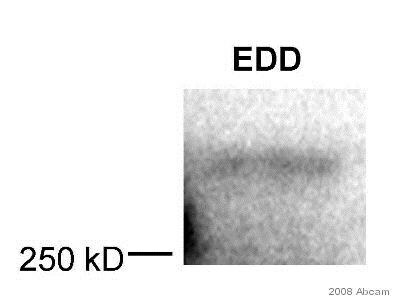 Recognizes and binds to proteins bearing specific amino-terminal residues that are destabilizing according to the N-end rule, leading to their ubiquitination and subsequent degradation (By similarity). 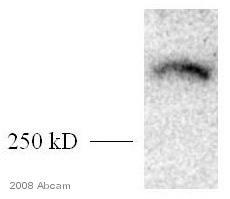 May be involved in maturation and/or transcriptional regulation of mRNA. May play a role in control of cell cycle progression. May have tumor suppressor function. 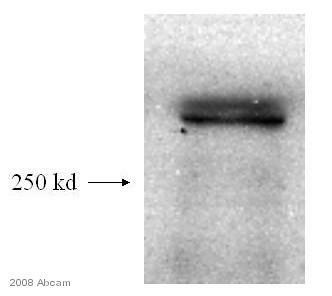 Regulates DNA topoisomerase II binding protein (TopBP1) in the DNA damage response. Plays an essential role in extraembryonic development. Widely expressed. 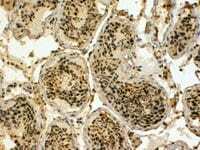 Most abundant in testis and expressed at high levels in brain, pituitary and kidney. Developed using SuperBlock Blocking Buffer (pierce) and pico ECL kit (pierce) to reduce the backgound observed - please refer to abreview for further experimental details. ab4376 (4µg/ml) staining of paraffin embedded Human Testis shows nuclear staining . 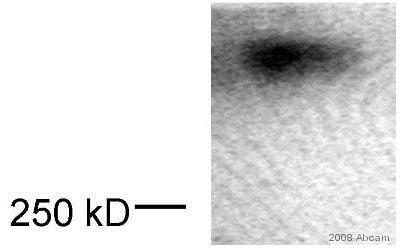 Steamed antigen retrieval with Tris/EDTA buffer pH 9, HRP-staining. 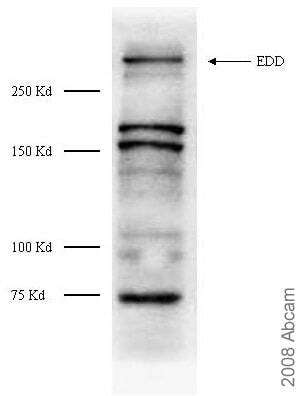 These results could not be obtained after antigen retrieval at pH6. Publishing research using ab4376? Please let us know so that we can cite the reference in this datasheet.